Experience a completely modern twist on the Frankenstein myth when “Replicas” arrives on Blu-ray Combo Pack (plus DVD and Digital), DVD and On Demand Tuesday April 16 from Lionsgate. It also is now available on Digital formats. Keanu Reeves (“John Wick” franchise, “The Matrix” franchise) stars in and co-produces this sci-fi thriller from producer Lorenzo di Bonaventura (“Transformers”). The film also stars Alice Eve (“Star Trek: Into Darkness,” “She’s Out of My League”), Thomas Middleditch (“Silicon Valley,” “The Wolf of Wall Street”), Emily Alyn Lind (“Revenge”), Emjay Anthony (“The Jungle Book,” “Bad Moms”) and John Ortiz (“Silver Linings Playbook,” “Bumblebee”). In this suspenseful sci-fi thriller, Reeves stars as William Foster, a neuroscientist on the verge of transferring human consciousness into a computer when his beloved wife (Eve) and children are tragically killed in a car crash. Desperate to resurrect his family, William recruits a fellow scientist (Middleditch) to help secretly clone their bodies and create replicas. When William learns that he can only replicate three of the four family members, he makes a decision with fateful consequences. Bonus features on “Replicas” home entertainment edition includes an audio commentary with director Jeffrey Nachmanoff and executive producer James Dodson, a making-of featurette and never-before-seen deleted scenes. 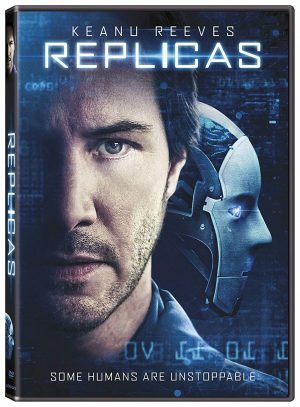 The “Replicas” Blu-ray Combo Pack and DVD will be available for the suggested retail price (SRP) of $24.99 and $19.98, respectively. Writer-Director M. Night Shyamalan (“The Sixth Sense,” “Signs”) completes a mind-bending trilogy begun nearly 20 years ago with “Glass,” available on 4K Ultra HD, Blu-ray, DVD and On Demand Tuesday April 16, from Universal Pictures Home Entertainment. The film also is available now on Digital via the digital movie app Movies Anywhere. “Glass” is a grounded-in-reality, comic-book thriller where the heroes and villains are people first. The thrilling culmination to the trilogy that started with “Unbreakable” and “Split,” stars James McAvoy (“Atonement”), Samuel L. Jackson (“Hitman’s Bodyguard,” “Avengers” franchise), Bruce Willis (“Unbreakable,” “Die Hard” franchise), Sarah Paulson (“Ocean’s Eight,” “American Horror Story”) and Anya-Taylor Joy (“The Witch”). Go inside the mind of master of suspense M. Night Shyamalan to uncover the connections and references that bring the three films together in one universe. Experience more than an hour of never-before-seen features elaborating on his process and artistic vision including an in-depth look at the making of the film, deep insights on the characters, a never-before-seen alternate opening, and deleted scenes. “Glass” offers a closer look at the world of the Elijah Price, also known as Mr. Glass (Jackson), David Dunn (Willis), and Kevin Wendell Crumb (McAvoy) as they experience a series of escalating encounters as they escape from an asylum and embark on a thrilling battle of good versus evil. Producers Shyamalan, Jason Blum (“Get Out,” “Halloween”), Marc Bienstock (“Before I Fall”), Ashwin Rajan (“Devil,” “The Visit”) and executive producer Steven Schneider (“Paranormal Activity” franchise) reunite. “The Kid Who Would Be King” arrives on 4K Ultra-HD, Blu-ray and DVD Tuesday April 16. Old school magic meets the modern world in this epic family-friendly adventure. Alex (Ashbourne Serkis) thinks he’s just another nobody, until he stumbles upon the mythical Sword in the Stone, Excalibur. Now, he must unite his friends and enemies into a band of knights and, together with the legendary wizard Merlin (Stewart), take on the wicked enchantress Morgana (Ferguson). With the future at stake, Alex must become the great leader he never dreamed he could be. An adventurous teenager summons the courage to help a friendly dinosaur escape from the clutches of a mad scientist in “The Adventures of Jurassic Pet,” arriving on DVD, Digital and On Demand Tuesday April 16 from Lionsgate. David Fletcher-Hall, Kyler Beck, and Ben Hall star in this live-action adventure “that the entire family will enjoy” (The Dove Foundation) and has been awarded the Dove Seal of Approval for all ages. “The Adventures of Jurassic Pet” DVD will be available for $14.98 (SRP). Calling all M. Night Shyamalan fans! Front Row Features is giving away a copy of “Glass” on Blu-ray/DVD Combo Pack to one lucky reader. To enter the contest, simply email socalmovieeditor@aol.com by April 22 with what film in the writer-director’s surprise superhero trilogy— “Unbreakable,” “Split” or “Glass”—you enjoyed the most. Good luck! Next PostPhotos: ‘Replicas,’ ‘Glass,’ More Available on Home Entertainment … Plus a Giveaway!! !